Rory McIlroy has revealed that he may not fulfil the requirements for European Tour membership next season, a decision which would rule him out of being a Ryder Cup captain or vice-captain. McIlroy needs to play four European Tour tournaments outside the majors and World Golf Championship events, but currently only has two on his schedule. Players must be a member of the European Tour to be eligible to play in the Ryder Cup and, under new regulations introduced in January 2017, "players cannot be a European Ryder Cup captain or a vice-captain if they decline membership of the European Tour or fail to fulfil their minimum event obligation in any season, from 2018 onwards." "I am starting my year off in the States and that will be the big focus of mine up until the end of August and then we will assess from there," McIlroy said ahead of the season-ending DP World Tour Championship in Dubai. 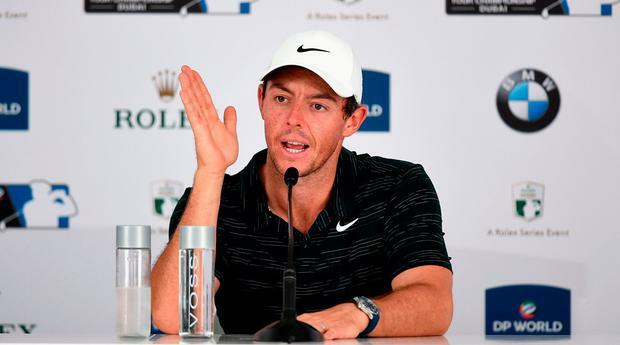 McIlroy's decision will be a major blow to European Tour chief executive Keith Pelley, who launched the Rolex Series last year in an effort to prevent Europe's star names from flocking to the lucrative PGA Tour. The eight events each have a prize fund of at least £5.4million, with the BMW PGA Championship moving to September and the Italian Open to October following the US PGA Championship switching from August to May. "Wentworth is going to be in September, the Italian Open and a lot of the big events are going to be after the PGA Tour season, so they are going to be the biggest events and strongest events in the world that week which is a good thing." McIlroy's slim chance to win the Race to Dubai for the fourth time disappeared when he was unable to win last week's Nedbank Golf Challenge, but the Northern Irishman hopes a new driver can help maintain his incredible form at Jumeirah Golf Estates where he has recorded finishes of 3-5-11-1-5-2-1-9. "I think back to the first tee shot at Augusta on Sunday; Wentworth on the final day; Akron, final day; Tour Championship, final day. The reason I didn't play better was because I didn't put the ball in the fairway, and the reason I didn't put the ball in the fairway is because I have this miss to the right with the driver," the 29-year-old added. "Unfortunately the new driver is only going to last a week because I have to get a new one next year again, but at least it gives me a better chance to win this week, I guess."